The best reads tend to be pretty heavy--both in their weight and their subject matter--and when it comes to taming those tremendous tomes, Breck Armstrong's substantial set of bookends are ready to roll. Breck's solid steel bookends are soldered with vintage roller skates and harken to the pastime of an earlier generation, adding a touch of whimsy and an archival touch to your library. These sturdy shelf accents put a unique spin on the bookend, keeping even your heaviest hardcovers from taking a tumble. Handcrafted in Michigan. It seems that old objects are just in his blood, some nostalgic essence. So it's only natural, Breck Armstrong would turn old stuff into new treasures. A ceramist at heart, that passion is on hold until the time comes to bring that aspect into his current life, but for now Breck's love for old houses, fixing old things and breathing new life into the found objects will hopefully bring you joy in your purchase! Thank you kindly for taking a piece in Breck Amstrong. My husband and I love to skate, hence I couldn't resist purchasing these bookends for our home! They really are a unique piece of art, but function in the library, as well. They make a fun conversation piece--love them! 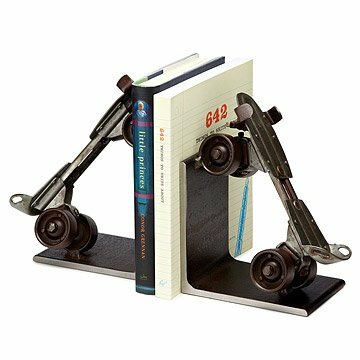 Breck's solid iron bookends are soldered with vintage roller skates and add an archival accent to your library.